The goal of First Call Restoration is to inform and educate consumers in the Poughkeepsie, Hopewell Junction, and Newburgh areas. Most consumers think mold is only a concern during the spring and summer. However, during the winter, we are often called because of attic mold concerns. Usually, the call comes in because our client noticed some water damage stains on their ceiling or wall and/or noticed a musty smell in their home. In many cases, the mold problems in the attic are caused by ice dams. The purpose of this articles is to explain how to prevent ice dams which are caused by the accumulation of ice and snow on your roof. As this article shows, the core problem with ice dams is they can lead to mold concerns, particularly in your attic. Ice dams result from the escape of heat into the attic which eventually builds up and melts snow on the roof. The ice dam is the ridge of ice that forms at the edge of a roof which prevents melting snow from draining as it should. Water that backs up behind the ice dam can leak into the home and cause damage to walls, floors, ceilings, insulation, and other areas. 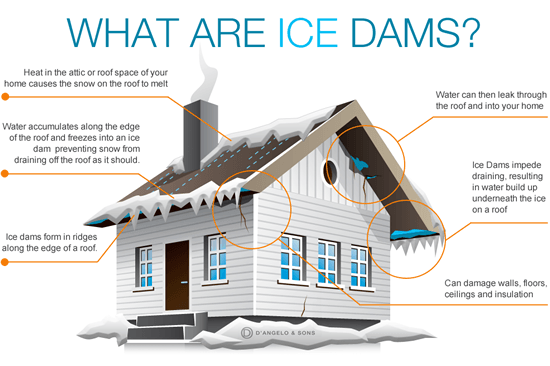 According to the Ice Dam Company, a visual inspection of the outside of your home can provide clues that you may have ice dam issues. You see icicles forming on the edge of your roof (with or without gutters). 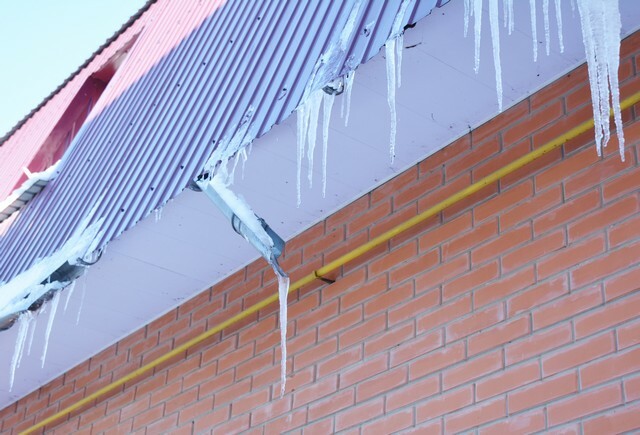 Ice begins to build on top of the gutter or lower edge or roof. Ice dams as little as 1″ thick can cause big problems. You see icicles forming behind the gutter. Ice or water manifests on the sidor exterior wall surface. Ice or water manifests inside or around the window frame. The key problem caused by ice dams is the water and moisture that leaks into the home. Mold thrives on moisture and grows because it feeds on the materials that most homes are made of: wood, drywall, wallpaper, carpet, ceiling tiles, etc. The final component required for mold growth is a temperature of 41 degrees to 100.4 degrees fahrenheit. As long as these three ingredients are present, mold will form and continue to grow provided it has food to feed on. This is the reason that the structural integrity of a home is compromised; mold is essentially feeding on the home. 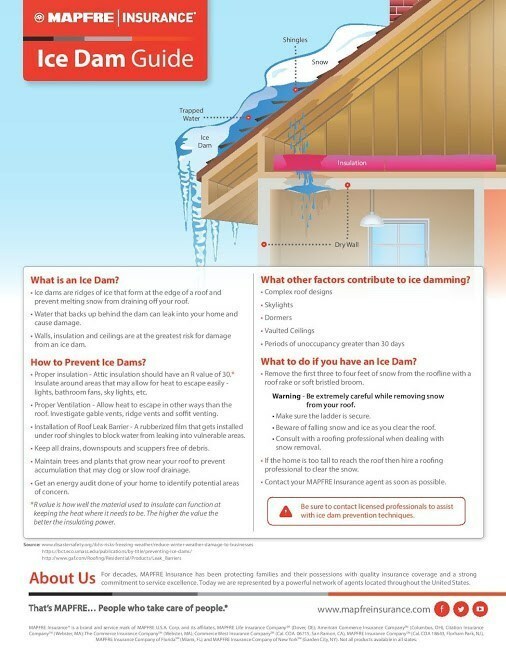 Ice dams are caused by heat escaping into the attic. Temperature is one of the key ingredients required for mold growth. Heat in the attic, which leads to ice dams, is caused by everyday activities in the household, such as cooking, laundry, showering, washing dishes, etc. Normally, these activities should not cause problems, ie. excessive condensation and heat in the attic. However, problems will occur if the attic is not properly insulated. One of the major causes of condensation in the attic is the lack of proper ventilation in the kitchen and bathroom required to vent vapour out of the home. Another major reason excess heat may build up in the attic is a direct result of builder negligence that vent bathroom and dryer vents into attics, crawl spaces, or over hangs, and not onto the roof. This poor building practice will cause problems because moisture and heat will build up in the attic. If you have gutters on the house – keep them clean and free from leaf debris. Ductwork in the attic should be well insulated and sealed from leaks. Air bypass – where warm air leaks through small cracks and openings – should be sealed. Check attic access ports in closets and can lights in the ceiling as potential areas of concern. How Can I Determine If I Have Condensation Issues In My Attic? Check all penetrations in your ceilings such as light fixtures and make sure there is no excessive gaps between the fixtures and ceiling. Got Ice Dam or Mold Questions? If you think you may have mold or indoor air quality concerns, call First Call Restoration, (845) 226-0868, or send us an e-mail. 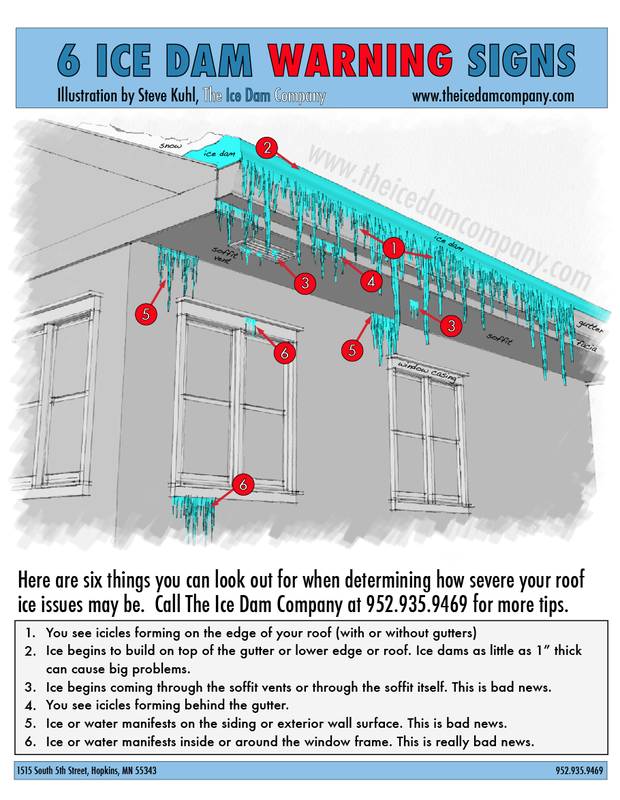 Ice Dam Causes and Prevention Summary! « What Are The Signs of Mold Sickness?